Chris Moore, Andy Ivester and other skeptics of sudden bay formation recently published a beautiful poster detailing their findings and discussing their conclusions. I was impressed and disappointed. 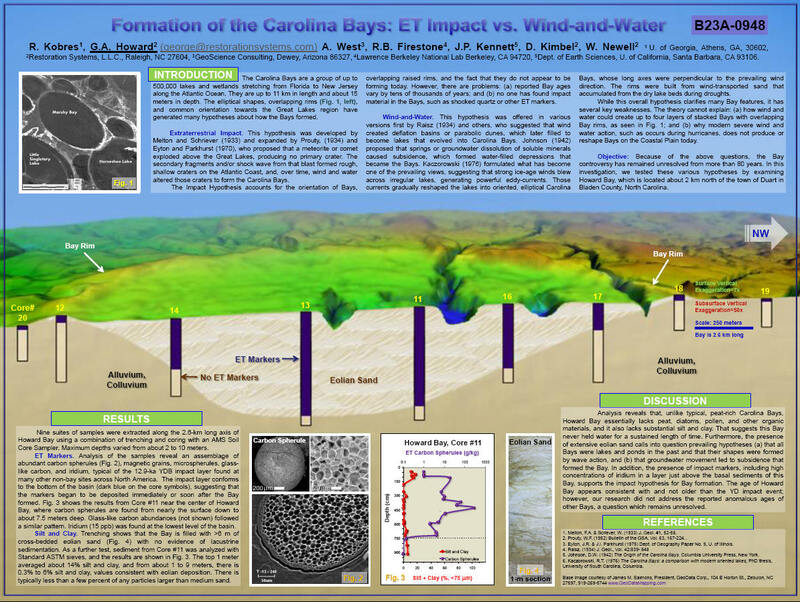 Impressed to see thoughtful research into the bay phenomena, disappointed that it ignored our previous published work determining that at least one (and presumably many more) Carolina bays were never lakes. And below is an excerpt from our abstract concerning the nature of the sands in the eponymous “Howard Bay,” and below that our 2007 Acapulco AGU Carolina Bay poster. Point is, to refute our conclusion that bays formed suddenly by invoking long-lived “lakes,” Moore and Ivestor need to disprove that, 1) Howard Bay is indeed a Carolina bay formed like all others; and/or 2) It was never a lake. If our poster helped reignite the terrestrial versus or ET causation debate, then the poster’s conclusions should be addressed directly. It seems the best way would be for Moore, Ivestor and team to core Howard Bay themselves and prove a lake once lived there. Further analyses of samples in complete core sequences reveal that, unlike typical, peat-rich Carolina Bays, Howard Bay essentially lacks peat, diatoms, pollen, or other organic materials, suggesting that this Bay never stored water for any sustained length of time. Furthermore, several trenches confirm that the deepest part of the Bay is filled with >6 m of cross-bedded eolian sand with no evidence of lacustrine sedimentation. This evidence calls into question prevailing hypotheses (a) that all Bays were lakes and ponds in the past and that their shapes were formed by wave action, or (b) that groundwater movement led to subsidence that formed the Bay….